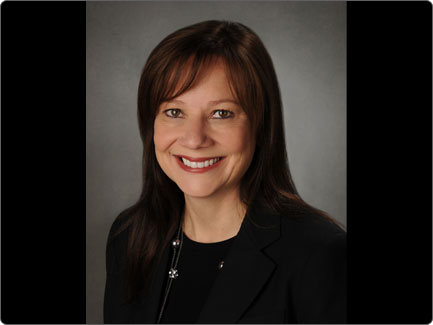 GM Names Mary Barra CEO. Is this a good thing? General Motors broke tradition today announcing their first female CEO. But did they really break tradition? Mary Barra, the new CEO, is a GM insider. She has been with GM for 33 years (Barra is 51; she started with GM when she was 18). Will she really bring anything fresh to GM? General Motors has long been likened to a huge ocean-going tanker that takes forever to change course. Mary Barra has been part of that culture for her entire adult life. I admit I do not know Ms. Barra; I've never even met her to the best of my knowledge. All reports so far are that she has "car-guy" credentials. How many times have you heard that about a GM CEO; how many times have we heard that "he has gasoline in his blood"? Some of the biggest car-guys have been only so-so CEOs of GM. I have met many executives from GM and I believe most were truly committed to building and selling the best vehicles on this planet. But somewhere in the process their enthusiasm gets lost. Barra is the current Senior VP of Global Product Development. She is responsible for the the new pickup trucks, Impala and Corvette. There is no question that the new Vette is far ahead of its predecessors. But that's what industry pundits have said about every new generation when they debuted. Reviews of the new Impala are good. The proof will come with sales. Same for the pickups. My opinion is that GM should have picked an outsider, someone who would come in and upset the status quo. Yes changes have been made at GM since the bankruptcy and bailout. Just maybe not enough changes. Most of the same players are there; much of the same old mindset is there. What GM needs, again in my opinion, is someone like Alan Mulally. Mulally came into Ford and really upset the apple cart in a good way. I am not even hinting that Mulally move to GM but that someone new and fresh, with a vision for the future and respect of the past should be CEO. The world needs General Motors but it doesn't need the old GM. Let's hope Ms. Barra is able to break the mold.